Right by the green is the road but the blue butterfly doesn’t fly there. How does it know exactly where it must flitter and go dizzy looking at something in its own colour? If you can fly, you can go anywhere, but this Common Bluebottle seemed to be part of this narrow stretch of nature between concrete. Graphium sarpedon, also known as Blue Triangle, is a native of South and South East Asia and is found in eastern Australia as well, it’s a species of Swallowtail butterfly. 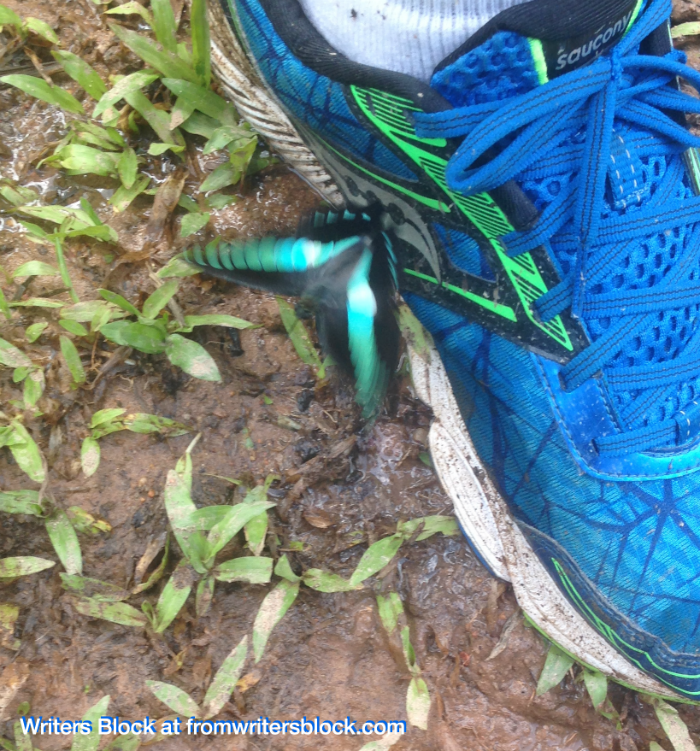 But really, at that moment when we chanced upon it on a walk, and it skimmed around us, heading straight for the blue shoe, I had no idea of its name or native land. All I could see was a pretty blue and black butterfly in a fascinating conversation with a neon blue shoe made of things definitely not natural. Nature and human made connected. I don’t know the science behind it, but the butterfly was attracted to the colour, there was affinity. Maybe colour is true no matter what, natural or created by us. We just stood there watching. After a while we walked ahead. On our way back, we were sure the butterfly wouldn’t be where we’d left it. We were wrong. It was waiting. And the moment it spotted the shoe, the play started again. It was almost as if Bottleblue had recognised an old friend. An unblock moment on the Green Corridor in Singapore, some time in December 2015. Thanks for stopping by. If you would like to know more about us and what we do, click here.